What are digital maps good for? Digital rendering – often referred to as digital mapping – is the process of visualising geographic data on digital maps. While early digital maps contained the same cartographic information as scanned versions of paper maps, the expansion of GPS has added many functionalities to digital maps, like the possibility to include points of interest and other location-based datasets. Digital rendering is a prerequisite for all geographical and logistical functions and crucial for tasks such as vehicle routing and optimisation. Why integrate PTV xServer Digital Maps API? PTV looks back on four decades of experience in the field of digital maps and works closely with leading data and maps providers. Additionally, we have been solving challenges within transportation logistics for international customers for 40 years. We offer highest data quality and level of detail, a large amount of extended content and functionalities, and many options for customisation and individual tailoring of map look and feel. For instance, our map data includes highly detailed and accurate truck-specific information like weight limits for bridges, height restrictions for tunnels and access restrictions for trucks – particularly relevant in urban areas. Our Digital Maps API is a software developer component, available as an easy-to-use and integrable on-premise solution or a cloud-based web service. Due to its standardised interface, the component can be easily integrated into an existing software architecture. Additionally, as developer, you benefit from abundant documentation as well as continuous support. Our Digital Maps API enables you to configure the map display based on your requirements and taste. You would like to start working with the API immediately without making any modifications? No problem. 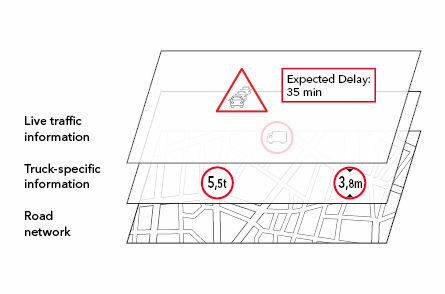 We offer several pre-defined map profiles that are carefully designed to fit most standard use cases as an out-of-the-box-feature. Choose between different options for displaying time-dependent data: Either pick a point in time or a time span and visualise all valid data that matches your time preference. We offer standard map profiles for different countries and continents. In these standard map profiles, the visible icons and descriptions are localised accordingly. Request single layers to build your own hybrid map. Choose between pre-defined layers (e.g. background, labels, additional content layers displaying information like truck-specific attributes or live traffic information). Change the order of layers to draw the polyline of a route between streets and labels. We provide a lot of additional premium content and data such as statistical and time-dependent absolute speeds, truck-specific driving restrictions and real-time or forecasted traffic events. The Digital Maps API enables you to visualise this premium content to make optimum use of our logistical algorithms. If you want to see integration samples, you can check them out in the xServer API Version 1 Code Sample Browser.